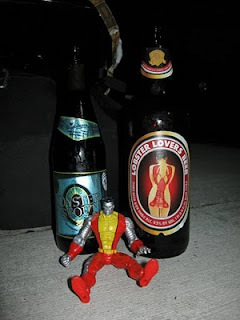 Not long ago, at Über Tavern, I met one the fellows behind the magic at Bottle Battle. As he is a fellow beer hiker, we hit it off immediately, but the idea to join forces and do a bottle shop beer hike didn't come to us until several months later. Great story, I know. It was an epic night of battles as we teamed up with Urban Beer Hikes for a three location triple header. 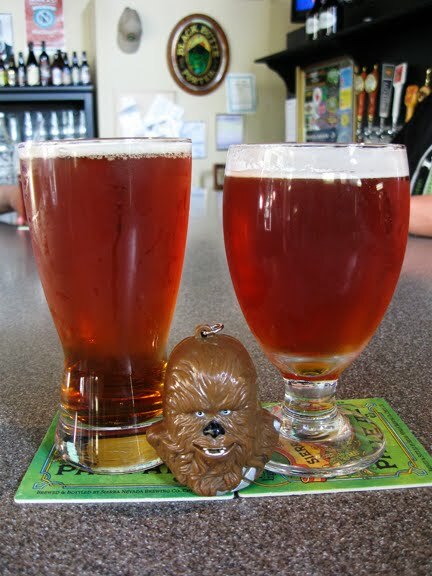 Our first stop was at Beer Authority [located in the heart of Lake City. It's a very cool shop and dog friendly, too.] for a Sierra Nevada Fresh Hop tap tussle. Aroma: Sweet malt and lemon rind. Flavor: Toasted malt and intense piney bitterness. Finish: Intense, long-lasting burnt toast and lemon rind bitterness. Color: Clear orange with slight red tint. Aroma: Grassy with some nice citrus. Flavor: Fresh, grassy hops with good malty sweetness as well. 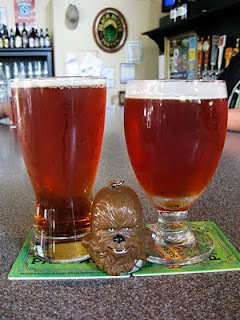 We were pleased to find two fresh hop beers from Sierra Nevada on tap so we promptly threw them into the ring together to see who would reign supreme. Both were served really cold, so it was kind of difficult to decipher the aromas but the Estate clearly had the upper hand. It offered the classic fresh, grassy hops with a nice citrus element as well. The Harvest struggled with its aroma and ended up being mostly sweet toasted malts with some piney hops in the background. Winner by unanimous decision: Estate Homegrown. Flavor: Cola, chocolate, coffee, earth. Finish: Bitter lemon and coffee. Flavor: Sweet cough syrup with some Belgian yeast characteristics. It was an international duel with Lobster Lovers hailing from Lithuania and Oyster Stout coming from Ireland. They both were feisty even before the fight as the Lobster offered an enticing naked lady/lobster label and the Oyster countered with the novelty of a pull off cap. In the ring things got ugly quick. The big Lithuanian was sweet and medicinal, just a mess of a beer. We couldn't even finish it. The Oyster Stout won by virtue of being not quite as bad. It had some weird sweet cola flavor that took away from the chocolate and coffee stout flavors. Winner by unanimous decision: Oyster Stout. Flavor: Crisp, with light citrus hops and some graininess. Finish: Grain and teeny, tiny bit of citrus hop bitterness. These beers are meant for hot weather, but we decided to see what they were made of on a mild October night in Seattle. It kind of turned into a slap fight with a lot of flailing of the arms without much contact. Both beers were predictably simple and didn't offer much more than something to wash down whatever you're eating. Turns out, Dave and I have different preferences when it comes to simple, session beers. 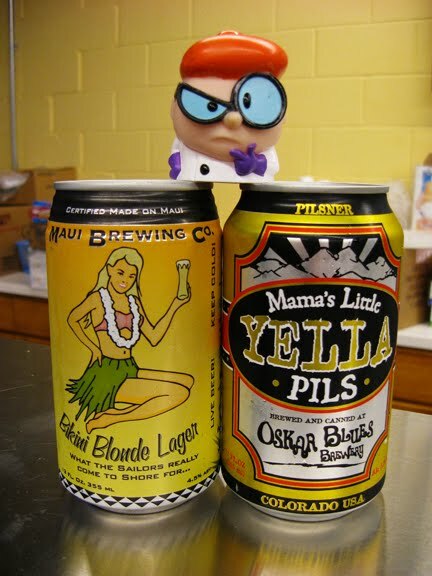 He prefers something a bit sweeter and thus chose the Bikini Blonde, I prefer something with some kind of hop presence so I went with Mama's. Final note: We rated them both "Good -", but they would probably be rated higher if we tried them on a hot day. They both would definitely be acceptable for a beach or a bbq. I have nothing else to add. Thanks to Ellen & Gibson at Bottle Battle. And thank you for reading.